to existing establishments for the time being... a lawsuit was filed. This is a transcription of an article that was in too poor a condition to be readable. A suit seeking to force the city of Las Vegas to issue a gambling license was heard today in the state Supreme Court. The action was filed by Roy Grimes, D J McCauley, and R H Davenport, who seek to conduct a dice game in the Pavilion building at Lorenzi's Resort in Las Vgeas. The three men declare the city officials of Las Vegas, by refusing them a permit, is guilty of discrimination under the state law. Two days later and prior to the filing of petitioner's license, the city granted gambling licenses to the Boulder Club, Las Vegas Club, A. T. McCarter of the Exchange Club, and Stocker and Morgan at the Northern Club, and then adopted a resolution that no license would be granted in Las Vegas except of those places of business that had had gambling licenses during the previous quarter and that no further or new licenses would be considered until a zone Was established by them for the operation of gambling houses and the policy adopted by the board governing the issuances of new licenses. April 17, (1931) the board rejected the application of Grimes, McCauley, and Davenport who thereupon applied to the Supreme Court for relief from what they class “unfair and unjust discrimination”. The petitioners were represented before the Supreme Court by Charles Lee Horsey, while the action of the board of city commissioners of Las Vegas was upheld by F. A. Stephens, city attorney. Several days later the board adopted a resolution fixing the policy of the board as contrary to the granting of further gambling licenses for the quarter save to those licensed during the previous three months but providing that members of the Ethiopian race might be granted licenses for the conduct of the game or games in a place catering exclusively to persons of the same race. 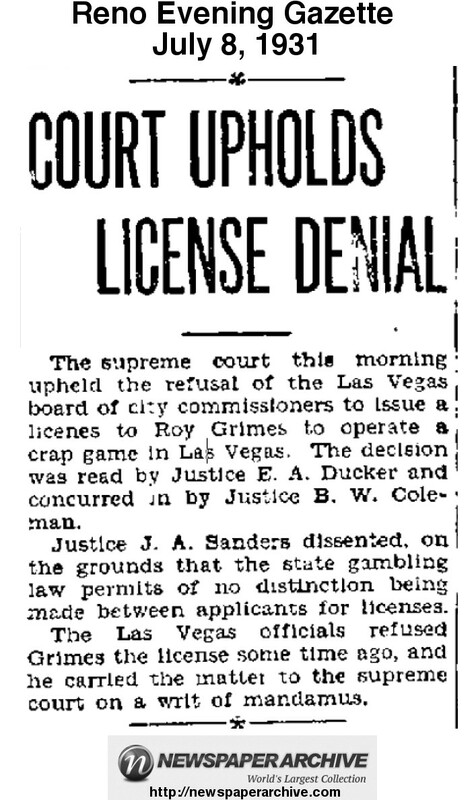 In the article below dated July 8, 1931 the applicants lost their battle for licensing at the Supreme Court of Nevada. The reference to A T McCarter in the article to the left was for the Exchange Club.